For an informal marriage ceremony, make the Storybook Chapel in Velarde your wedding destination. Built in 1903, Storybook Chapel nestles among whispering cottonwoods in the beautiful Rio Grande valley. Our professional wedding planners can customize a complete wedding package for this rural locale. Velarde, a traditional small town in scenic northern New Mexico, is located 40 minutes north of Santa Fe. 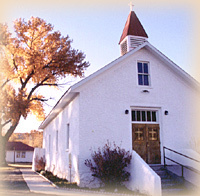 The nearby Parish Hall is a convenient wedding reception site. 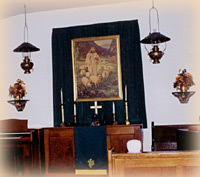 This Methodist sanctuary accommodates up to 45 guests. Transportation included.